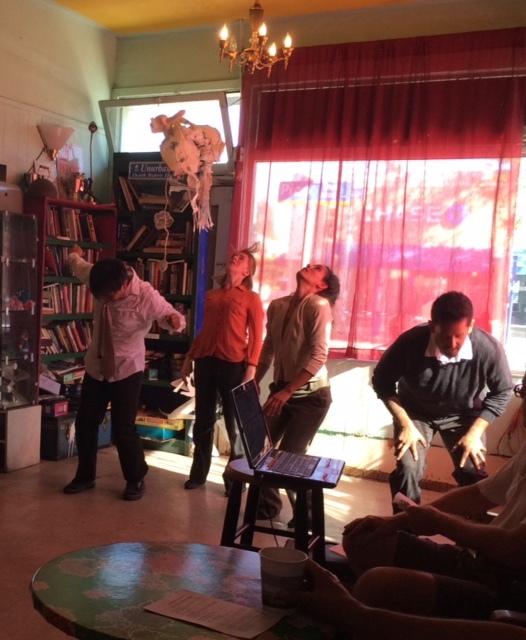 The first in a series of three coffee shop locations, the Santa Monica café Unurban was a quirky and dynamic location for a dance performance. I attended Keith Glassman’s Coffeehouse Dances last year and enjoyed the diversity, the mixed media, and the hip feel of seeing dance in public, amidst the locals and passersby. This afternoon continued the tradition of the Coffeehouse Dance, as it included short works by four LA choreographers that were diverse and entertaining. The first piece, Chance Encounters, choreographed by Rachel Lopez in collaboration with the dancers, was a duet in which a young male and female dancer seemed to meet for the first time. The coffee shop was a perfect setting for this simple and sweet love story as the dance reenacted a narrative that has occurred more than once in a coffee shop. The dancers performed with two short stools, inverting over them, sitting on them in a variety of positions, and standing on them in intervals. I appreciated the design of the individualized movement material performed on the stool. The moments of near union and spatial contrast provided a playful visual that clearly connected the dancers while keeping the movement invention unpredictable and engaging. Paradis, draft #1 was choreographed by Louis Cornejo in collaboration with dancers. This quartet, two men and two women, was a fascinating study of movement evolution. Beginning just with looks side to side, up and down, the dancers grew the action of the head, to include shoulders, chest, arms, hips, legs. . . in a gradual accumulation of motion that was the dance. The structure of the piece was clearly organized into thematic sections in which the dancers seemed to improvise around a movement theme or family of concepts. 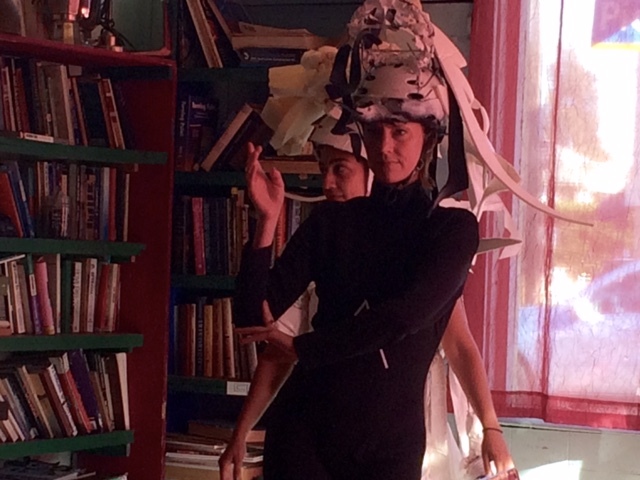 The dancers had a clear awareness of space and each other as they weaved skillfully through the tiny performance space. The simple musical accompaniment, mixed by Cornejo, included a regular beat that drove the movement forward and prompted a rhythmic component in the dance that was underscored by the use of gestural repetition. A favorite moment featured a gesture-driven solo by Crystal Sepulveda that contrasted a soft canon performed by the other dancers. The ever-shifting texture of this dance was hypnotic. 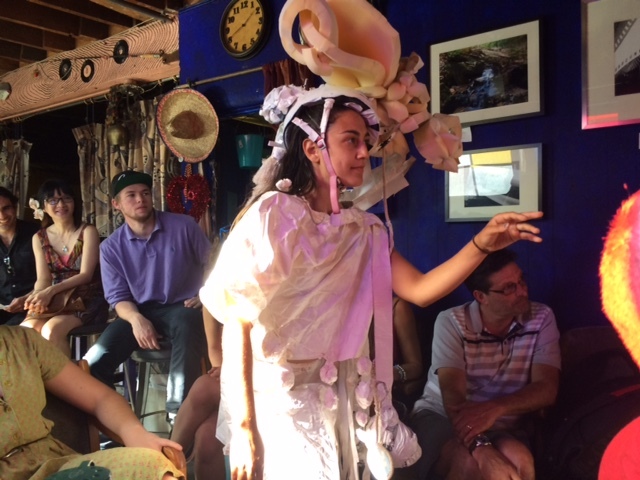 Rebeca Hernandez presented a work entitled Memorias de un No Abrazo. Translating the title with my (very intermediate) Spanish skills, I understood this piece to be about memories and a sort of forbidden or denied hug. 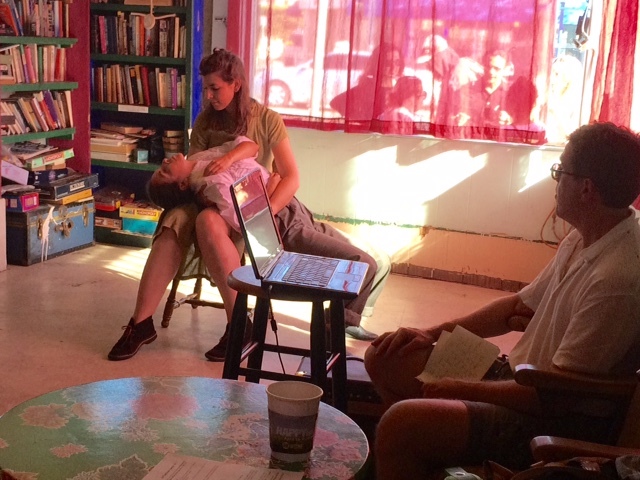 This female duet in three parts began with a strong narrative of a reserved mother and yearning daughter embedded within a movement study of negative space and missed connection. The bodies became a landscape explored through gesture and sliding contact. The give and take aspect to the narrative conveyed a clear sense of loss as interlacing arms were unlaced and connections were missed. The first section of this piece was the strongest with a sensitivity and simplicity that was powerful. The second two sections included larger dance movements, sweeping through the space with free flow in a released style that was nicely executed, but lacked the narrative power of the first section. Overall, this piece was successful in conveying a personal narrative of conflicted emotions and missed connections. The afternoon closed with Laurel Jenkins ‘ duet IMAGE/ACTION/TEST. Performed by Jenkins with dancer Devika Wickremesighe this interactive piece required audience participation! The audience was asked to direct the dancers (Dancer A and Dancer B) to start and stop, thus co creating the dance in the moment. The audience loved this, and had fun “playing the dancers” like one might play a record. Dancer A start! Dancer B stop! The innovative design of the dance charmed the audience almost as much as the movement vocabulary itself. The dancers performed straight faced as they merengued, step-touched and hip-circled their way through the dance in fits of ridiculousness. In some ways this piece was a study in the ridiculous. The absurdity of it all, outlandish headdresses, costumes and movement alike, made this dance feel fresh and un-restricted. So it seemed like a miracle came together to perform a short unison phrase. Clearly the dancers were ready for a variety of unknowns and it was the unknown elements that made this piece perfect for this unpredictable venue and adventure of live performance in a coffeehouse. The show lasted only about 45 minutes- but for a free dance show with a cup of cold-brewed coffee in hand, it was perfect. After a late start due to technical difficulties, the sympathetic audience was eager to enjoy the dancing at all costs. Despite people answering phones, ambulances driving past and technical challenges of all types, this show was refreshing. It is a reminder that dance need not always come in a bright shiny package. Sometimes it is best consumed on a sunny afternoon in a worn wooden chair with a croissant in hand. There are two more chances in the next two-week to see Coffeehouse Dances IV. Visit www.keithglassman.org for more information.